Many of you that know me, might know that I love my slow cookers. All three of them. I typically use them to make sauce, chili, or beer and onion chicken, but I keep seeing slow cooker desserts online and decided I had to try one. 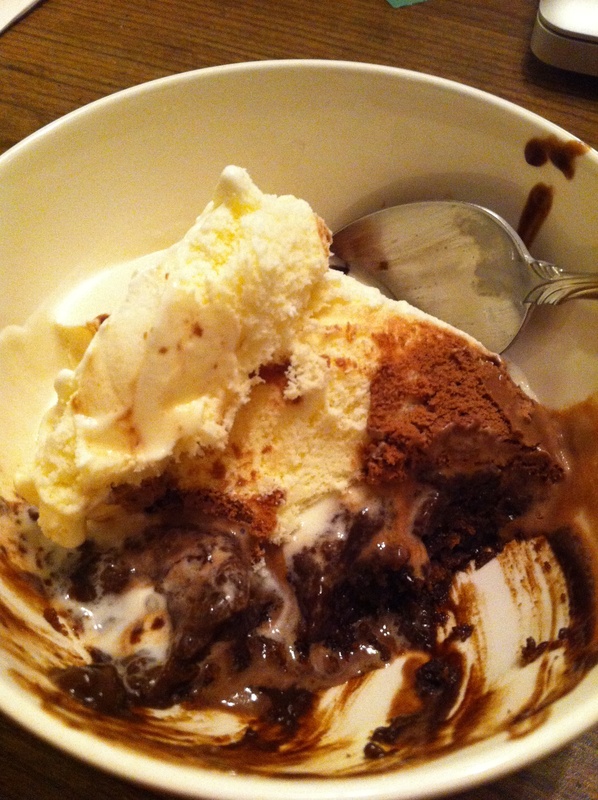 I picked Slow Cooker Chocolate Cake from Recipe Shoebox, who found it in a Betty Crocker Book. This cake was very easy to make, and super delicious. The hardest part was waiting for the 30 minutes after cooking to end so we could dig in. Vanilla ice cream is essential to this dish. The only thing is this is an ‘eat it the night you make it recipe’ as I am not a big fan of nuking cake. I made this in my 2qt slow cooker. You need to use the small one for the recipe as printed, otherwise the cake will be dry and you won’t get the sauce. SUPPLIES: Cooking Spray, 2 QT Slow Cooker, Mixing Bowl, 4 Cup Measuring Cup, Spatula, dry ingredient measuring cup, measuring spoons. 1. Spray the inside of your slow cooker with non stick spray or rub butter all around inside the bowl. 2. Mix the flour, sugar, cocoa, baking powder, and salt in a bowl. 3. Stir in the milk, oil, vanilla until smooth. At this point you can add chocolate chips/and or nuts. 4. Spread the batter evenly in the crock pot. 6. Add the brown sugar and the cocoa powder and stir until smooth. You may need to use a whisk or fork to get out the lumps of sugar. 7. Pour the liquid mixture carefully and evenly over the top of the cake batter in the crockpot. 8. Cover with the lid and turn the slow cooker on high for 2-2 1/2 hours or until a toothpick comes out clean. Then turn off the slow cooker. The longer you wait to serve this, the thicker the sauce will get. You MUST serve this with the sauce. Its completely essential. You are my very 1st commenter! Thank you and I hope to see you again.